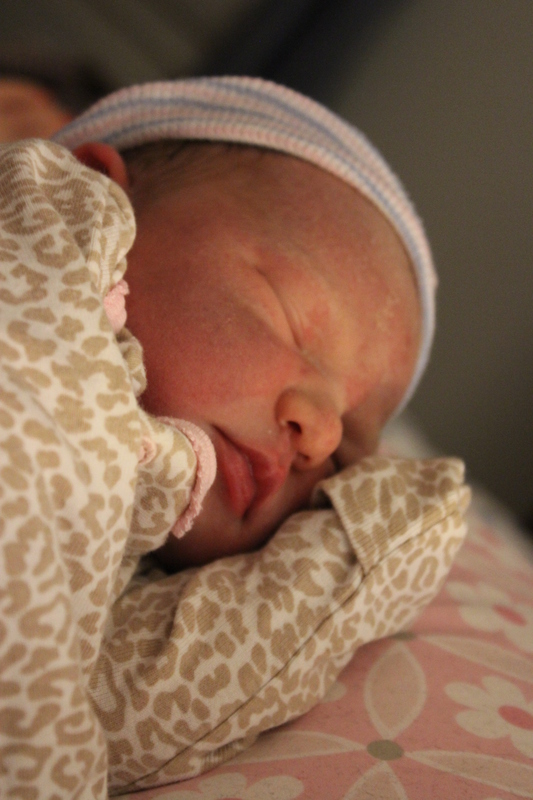 This is Annaleigh’s birth story. This whole process taught me that plans are good, but plans may need to be changed when life happens. At 35 weeks, our house flooded due to an upstairs toilet that overflowed when the handle got stuck down. We had to move out of our house for 2.5 months total. Of course my planned home birth was not going to happen. At first we were moved into a Residence Inn while our house was worked on. We stayed there for 4 weeks. Then finally we were able to move into a cute rental house. You can read more about our house in my earlier post. 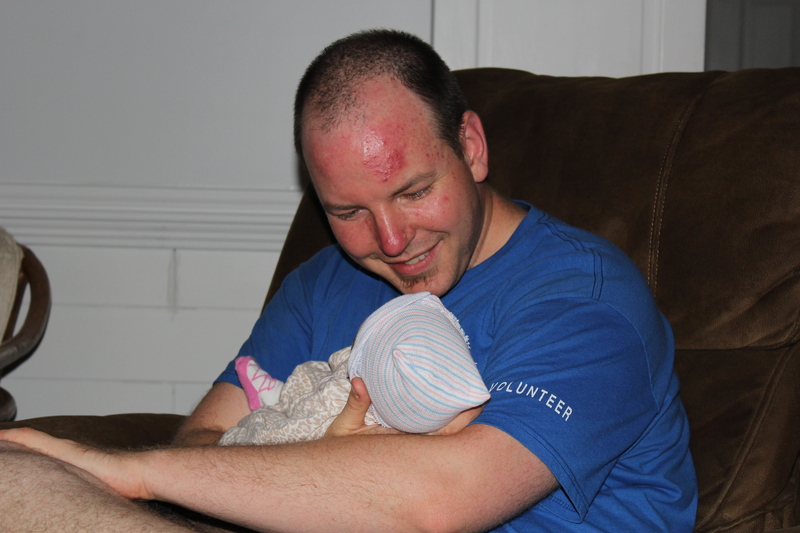 We were in the rental house one week when I went into labor. 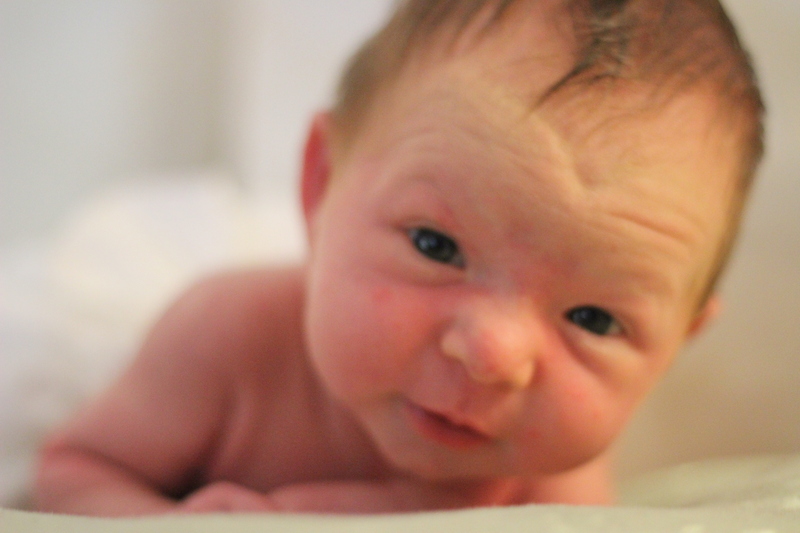 Here is my planned home birth – then reluctantly planned hotel birth – then a planned and successful rental house birth. Tuesday I had my 39 week midwife appointment. I was 3 cm 70 % effaced. My midwife was ‘surprised’ I was still pregnant because I was having so much false labor ever since the house incident due to added stress. She figured the baby was malpositioned and this was causing all the false labor patterns with no actual labor. She recommended I get adjusted by chiropractor who specialized in pregnancy adjustments. She also told me to bind my belly (wrap it tightly) and do positioning exercises to encourage baby to move to left side and off right (so she wouldn’t be tempted to turn posterior). So Thursday morning I go to the chiropractor to get adjusted. He also did a few pressure points to encourage labor. He told me that he thought labor was close but probably would be Friday. I got back to rental house and lost more mucous plug, progress!!! Baby stayed on left side or midline almost all day. I went shopping with my mom and Aidalyn (bought a few newborn outfits), walked about 20 minutes and took Aidalyn to the park to play (no contractions or at least no false labor or signs of labor). I decided that I didn’t want take out tonight (we had eaten out almost every night since the house flooded because I was so over cooking anyways and being out of my house added to the reluctance to cook). Feel domestic for the first time since we had to move out of the house. I cleaned the kitchen and decided we should cook burgers for dinner. Adam put Aidy to bed after dinner. We were in the living room watching TV. I decided to bind my belly and start doing pelvic rocks and inversions because Annaleigh was back on right side. All of the sudden, I felt a leak. Hummm was that my water??? I got nervous and start shaking. I called Nancy my midwife. She said to call her back in an hour or if my contractions start. I change my clothes… Maybe 10 minutes later… I soaked a pad plus underwear again during a small contraction – this is my water!! I called Nancy she said she would be there by 11. Midwife came over at 11:00 checked me. I was 3-4cm dilated I think. She had been up for over 24 hours due to other births she attended, so she decided to snooze in the recliner. Mild contractions started around 11:30? About 5 minutes apart. Contractions started to get harder around 12:30 2-5 minutes apart. 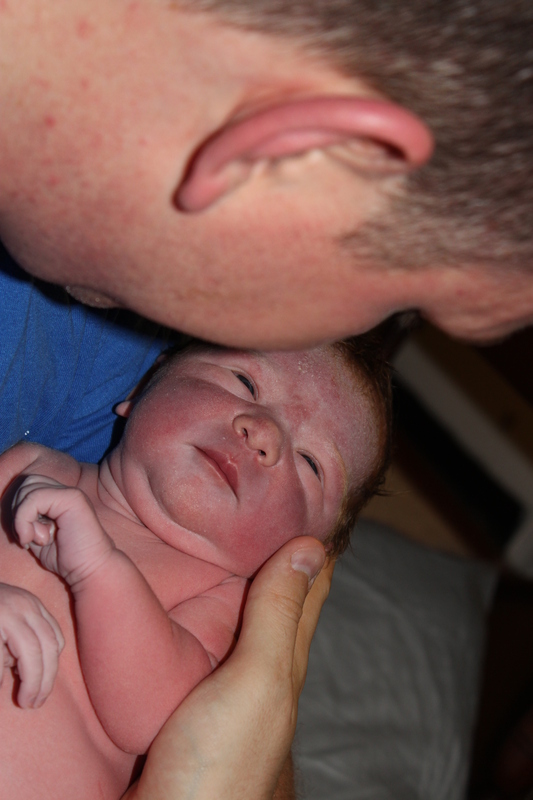 1:15 Midwife broke my water the rest of the way to try to turn Annaleigh, but she didn’t want to shift her head. She was on right side… which meant it could be a harder labor. I was a 7cm as soon as she broke the rest of my water. Nancy told me that meant it was the right thing to do. Contractions obviously were immediately stronger without the rest of the water cushion. I just rocked through them and breathed. Harder but manageable. My very next contraction was a pushing one. Whoa! Okay. That took me off guard. I was not ready and it was hard and fierce. I had trouble controlling my breathing. Nancy coached me to breath shallow – not deep breaths. I asked if i can get in the tub. Nancy said when you are desperate. I immediately said I’m desperate!! Nancy and Adam prepped the tub and I got in before my next contraction. 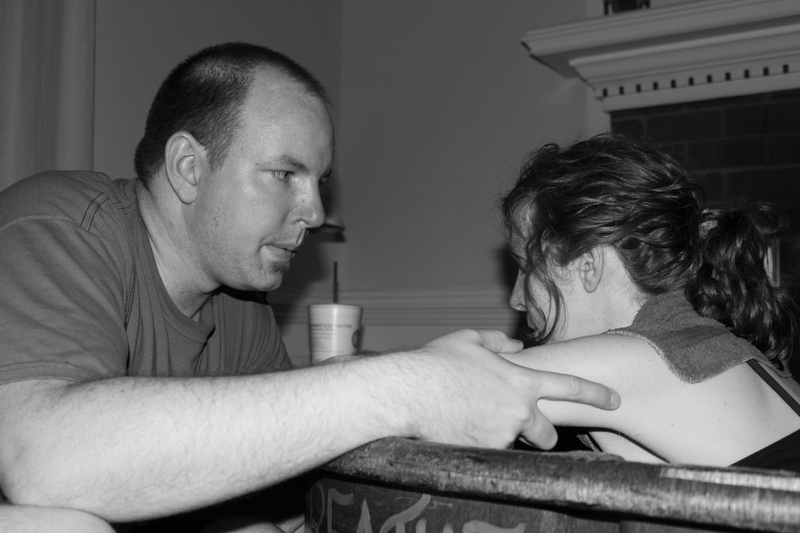 Pushing contractions were crazy intense and hard. I had to really focus on keeping shallow breaths to not tear. I just wanted them to end. I was in tub about 7 minutes before Annaleigh was born. I was able to reach down and feel her head come out and guide her body out. No tears!!! Yay and minimal swelling. I tried to push out the placenta in tub, but I just couldn’t get it to come out. (Just get it out so these contractions will end!!!) I got out and sat on the birthing stool and it fell out immediately. Annaleigh’s Apgar scores were 9 and 9. So relieved!! 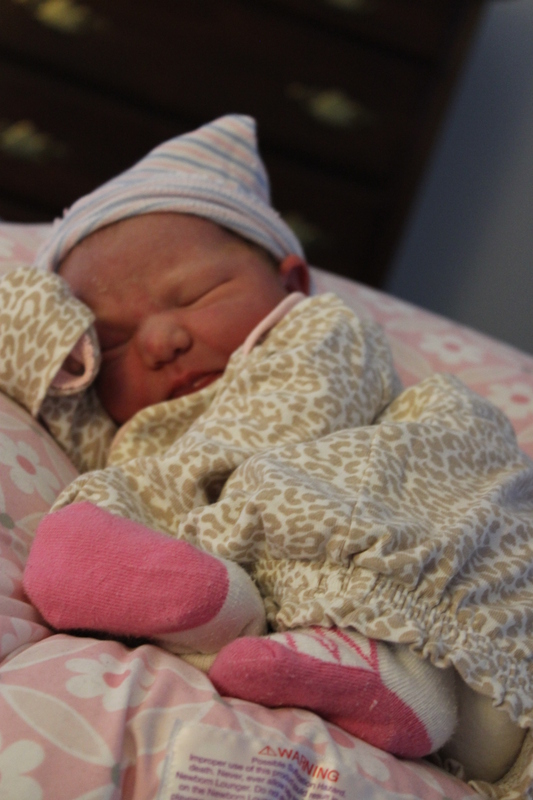 She was 8 pounds 1 oz and 20 inches long. It was basically 2 hours of active labor. Differences from last birth: a little faster (2 vs 4.5 hours) transition was horrible with my first labor including chills, violent throwing up… And lasted a few minutes. This time I hardly new I went through transition. This time water broke before labor – and last time I think my water broke in the tub. Last time, retrospectively, I’m wondering if Aidy was blocking a nerve or something because pushing her out I only felt pressure and talked and breathed normally pushing her out. This time it was rough. I’m not sure I was really ready for it. Thankfully it was fast and done. Last time I was SO swollen and although I didn’t tear, I was given one stitch. I also had zero bladder control for at least 3 days – again leading me to believe I must have had some temporary nerve damage. This time I feel amazing. Slightly swollen, but not bad at all!! Adam said the tub was pretty clear after this birth and with Aidy i had more blood in the tub. Nancy also manually compressed my uterus to help it contract and I didn’t lose that much blood after labor. I’m so glad I chose a natural birth for both of my little girls. Both labors were so very different, and now I am blessed with two very different kids. Have you had a birth that didn’t turn out how you planned? How did you cope? Such a doll! Loved reading your story. We had two natural hospital births but the last one came so quickly we were at our local hospital instead of the one we planned on and they weren’t very supportive or my choices. 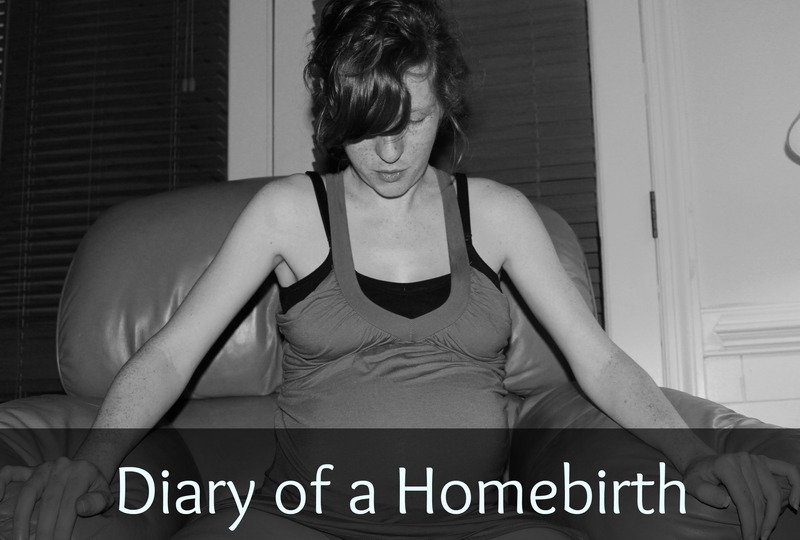 A homebirth is something we are really considering if baby number 3 happens. 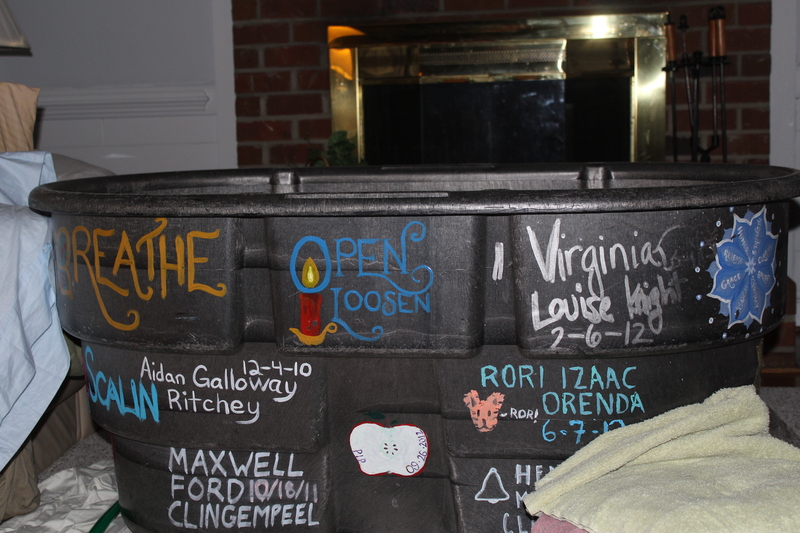 I loved my homebirths! Hope you get your chance.